Take your skating experience to the next level with the Rollerblade Macroblade 110 3WD Inline Skates. These skates feature 110mm wheels and SG9 bearings that are going to give you tons of speed with less vibration, thus giving you a smoother ride than ever before while provided extra durability. There is a High Performance Form 5 Star Fit liner that provides you a comfortable fit when strapped in. These skates features the Rollerblade 3WD technology that will let skaters enjoy an easier, longer and smoother skating session with awesome control. The Macroblade 110 features knit technology that lets your feet breathe during long skating sessions so they stay comfortable and dry and the material will shape to your feet to keep the skate lightweight and comfortable. The Macroblade 110 features an aluminum cuff buckle, 45 degree straps and laces that will give you the secure fit you desire. These skates are fast and agile. Quick to transition and surprisingly lightweight. I found the break in period to be fairly easy and I'm enjoying my rides immensely. Absolutely love these skates. These are my first 3WD skates and was surprised by how comfortable, breathable and fast they are. My new favorite pair. Q: I like the color of these skates better than the female vision. Would these skate fit right on a female? A: Men's inline skates are going to offer a slightly wider fit and the cuff is going to be slightly higher up in the back. Women's inline skates are narrower to fit a woman's foot shape better and have a lower cuff to accommodate a woman's lower calf muscle. A: I skate on both 3 wheel and 4 wheel, the big difference in the 3wd skates are maneuverability as the 3wd skates have a shorter wheelbase they are able to corner much better, 4 wheel skates are traditional and offer more top speed in my experience. For reference I skate with a 4x90mm Maxxum and the 3x110mm Twister Edge. I personally like having the option of both but more times than not I choose my 3wd skates for the maneuverability and the 3x110mm offer great control over some debris like small rocks and twigs I find at my local park. Q: Could you put smaller wheels,say 100mm, on these without losing much performance or overall functionality? A: Sure, that wouldn't be bad at all. Note that as you go down in size you will lessen your ease of maneuverability as you are making the wheels farther apart. Q: Hey Team, I appreciate good CS and your replies to these questions are great. I'm buying online from overseas and I'm concerned about sizing - exchanging would be a nightmare! I'm 28.8 mondo. Do you know if these run small at all? Also out of curiosity, do you usually recommend the RBs over the macroblades? If so, why? Im a big fan of the knit upper on these but could be pursuaded if the others better! Thanks for your time! A: I find Rollerblade skates to fit true to size, outside of the Twister Edge, Twister, and Maxxum skates which Rollerblade recommends going a full size bigger. With this model I'd go the same size as your standard shoe size, and it sounds like you are going to be taking your shoes in a size 10.5 or 11 US men's size. At 28.8 you are just above the size 10.5 mondo size which would be a size 10.5, and honestly that is the size I'd recommend in the Macroblade. As far as the RB's vs the Macroblade, it's going to be all about what type of skating you are doing, the RB's with the hard plastic outer are going to offer more protection for urban style skating and the Macroblade is going to be a bit more comfortable for recreation and fitness skating. Q: Can the frame on these skates be removed? If so, can you use non-Rollerblade brand frames on these skates? A: Sure can, the frame spacing on the Macroblade 110 is 165mm so you can use other aftermarket frames of that size. 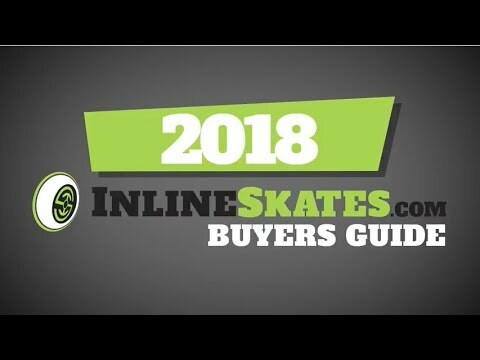 Q: Couple more questions... 1) Do any of the skates you carry have any other braking system other than the back brake where you lean back on one heel and raise the front of the skate in the air? I dislike this system, and have usually braked by dragging one skate on its side for more stability when stopping or controlling speed at high speeds, but this is not ideal as it wears wheels both rapidly and unevenly. And a related que 2) Compared to wheels I'd buy for the Rollerblades I used to own, the wheels look very sparse in amount of polyurethane or rubber or whatever type of material is used in the part of the wheel that touches the road. How often must the wheels be replaced (say with moderate daily use) and how much do replacements cost? A: 1) Sounds like you would benefit from Rollerblade's ABT braking system. This system looks similar to a standard braking system but it works with the cuff of the skate so that as pressure is applied back on the cuff it actually lowers the brake so that it can touch the surface and brake while the wheels stay on the ground. This system is currently offered on the Macroblade but unfortunately is not offered on a 3WD skate like this one. 2) Replacements can be found on the site under accessories and are varied in price. Although some modern wheels can be thinner the urethane keeps getting better so they can wear slower. For skating daily you may have to replace bi-monthly but it really depends on how often you rotate and where you skate, etc. Q: These skates almost look like the shoes can be detached from the skates – can they? If not, do you have any models (preferably similar otherwise) that do have detachable shoes? A: No, unfortunately at this time there are no real recreation or fitness style inline skates that offer this functionality. Q: Does the Roller blade microblade 110 come in women's sizes? A: Yes, there is a women's specific version of this skate. You can find them by searching for "macroblade" and you will see the women's specific skate show up. The women's specific version offers a slightly narrower fit specified for a woman's footshape, as well as a lower cuff to accommodate women's lower calf muscle. Q: About how fast should a healthy teenage guy be able to go on flat pavement in these things? I like exacts because numbers are fun to know, but any near estimate is helpful. Thanks. A: Not entirely sure but you should pick up a pair and do some testing and get back to us :) In doing some general research I found an article stating that most skaters top out around 9 mph and top speed for marathon skaters is around 20 mph, so with that said I'd see you getting up to 15 mph tops on these when really pushing but in reality I have no idea. 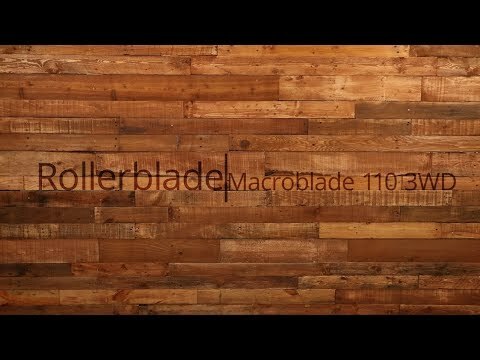 Q: What is the frame length of the macroblade 110 three wheel drive? A: Frame is approximately 290mm in length.